Building Social Community in an Online Course through Online Icebreakers! Background: I teach online literacy courses, both undergraduate and graduate at The University of Texas at Arlington. I have been teaching online since 2008! Drawing on ideas from Canadian scholar Terry Anderson and others (see here), a key foundation of online learning is to foster a Community of Inquiry (COI) where students are engaged not just cognitively engaged (which is what we often think learning is solely concerned with), but also socially engaged in a low-risk environment where the teacher is also virtually present in a variety of ways. A new book (2014) by Jon Dron and Terry Anderson, Teaching Crowds: Learning and Social Media (a free PDF can be located here) focuses on the COI framework on the wide vareity of social learning that can take place in an online course. I am looking forward to reading this! In the meantime, a major goal of mine as an online instructor is to intentionally and strategically foster better student-student interaction to build a more solid foundation for discussions and interactions for students. Based on my readings of the following Jossey-Bass books, I started to implement the idea of “online icebreakers”. The two books that inspired me are below. They are quick reads! I made up most of the icebreakers myself, but several are variations on the icebreakers described in the books below and I have indicated this below. Engaging the Online Learner: Activities and Resources for Creative Instruction (Rita-Marie Conrad and J. Ana Donaldson) Jossey-Bass Publishing, 2011. 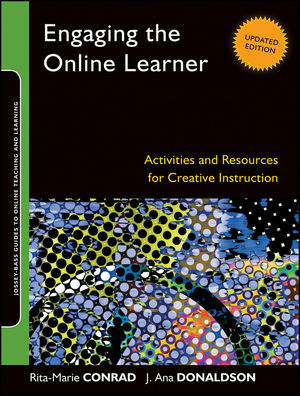 Continuing to Engage the Online Learner: More Activities and Resources for Creative Instruction (Rita-Marie Conrad and J. Ana Donaldson) Jossey-Bass Publishing, 2012. These go in the general discussion board area on my learning management system (Blackboard in my case). During week 1, or, prior to the course start, if you choose to open your learning management system up a bit earlier than the official course start date, students are required to post to at least one icebreaker (2-3 paragraphs). Writing a more extended post with more detail is required in the course I teach on writing; it has the dual purpose of helping students consider one of the icebreaker topics as a final writing topic for a key assignment in the course of creating a personal piece of writing. Students are required to post at least three comments to peers. Each icebreaker is a separate thread within a forum labelled “Online Icebreakers”. Students reply as comments to to a thread; students do not create their own forums. Create one icebreaker topic for about every 5-10 students. E.g., I have 130 students in an online course, so I have about 15 icebreakers so any one thread is not too “crowded”. Choice is essential. So if you have 25 students, I recommend about 5-6 icebreakers. Encourage students to do more than one icebreaker; creating an initial post in response to one icebreaker is a minimum). I even get icebreaker ideas from social media. Encourage students to embed multi-media! Directions to Students: Complete at least ONE online icebreaker. Go inside this forum to view the icebreakers. Your initial post should be at least two paragraphs. This is a chance to get “warmed up” in terms of writing so do not be skeletal here. Try to include a multi-media element (optional) such as a link, picture, or screenshot of a Google Map (if you are doing “Location, Location, Location”). People may be sharing personal views and perspectives here and elsewhere in the course (e.g., assignments). Please be respectful that we all have different points of view and experiences. When replying, look for strength and positive things to say in the writer’s ideas. Stay focused on providing constructive ideas and feedback. All work shared on discussion boards is confidential. Please do not share what you are reading with others. For this icebreaker, share what is on your top five “bucket list” of things you want to do and get accomplished in life! Share your list and why you selected what you did for each item on the list! Describe your dream job as an educator. What are your future plans as an educator? Can you locate a job ad that matches your dream job? If so, please also post the link! Describe how you can prepare for this dream job! Feel free to use a Word Cloud (Wordle or Tagxedo) or put your text in front of an image using a photo editing app or website. Describe your six-word memoir in several paragraphs and tell us a bit more about YOU beyond the six words! What cities have you lived in? What was the best thing about living in each of these places? Feel free to include pictures! Include at least 2-3 places. If you wish, include a map with an arrow showing where you have lived. Dr. Semingson’s places lived (in chronological order): Austin, TX; Kodiak Island, AK; Fairbanks, AK; Anchorage, AK; San Diego, CA; Santa Barbara, CA; Austin, TX [returned at age 25! ], Dallas-Fort Worth Metroplex. Feel free to include images! Pictures are encouraged in the online icebreakers but are not required! Also post three or more comments to others. A comment is a paragraph or more in length. Don’t be skeletal in your writing in the icebreaker post and comments. I grew up in Alaska from age 1-10! [I did a screenshot in Google Maps and then cropped it and added text using “Paint”. What movie or song summarizes who you are? Include a link to either lyrics or a YouTube video of the song (if it’s a song) or a link to a movie site (e.g., IMBD) describing the movie. Why did you pick this? What genre is the song and/or movie? Explain and also respond to other posting(s) on this thread! What are you passionate about in life and in work? Make a list of these. Share and elaborate upon these. Be sure to leave a comment for someone on this thread and also other threads if you have time! Icebreaker 7: Teachers who Blog! Do you have a blog to share with us? Do you have a blog? Even if you don’t post often, feel free to share your blog (or blogs if you have more than one) link here (be sure it hyperlinks by clicking the link button and inserting the link). Share what your blog is about and what you hope to post in future posts (“blogging goals”). I have heard of people setting up a schedule for themselves of posts! If you want to start a blog, I suggest Blogger (through Google) or WordPress. Dexter says, “Hi!”. Hello, Everypawdy! Dexter has a chaise lounge and stairs to get on it! Dexter gets tucked in with his blankie! Are you an athlete or do you have a sport you especially like? I am primarily a swimmer at heart, but I am currently learning to play golf and have started doing weight training! What are you reading? Share some titles and authors of your favorite books! What genres do you generally prefer, as a reader? Feel free to use a list. Explain your book choices in detail! Feel free to add links to the author’s website. You can focus on children’s/YA books or books you are reading (personal and/or professional). If you wish, add quotes by your favorite writer(s). Icebreaker 11: Major Turning Point(s)! What has been a major turning point in your life? There might be more than one turning point…For me (Dr. Semingson), mine include getting a PhD, buying my first house, and my childhood move from Alaska to San Diego at age 10.
Who do you admire most? Why do you admire them? It can be someone from your “real life” or it can be someone you have never met or even someone from history that has passed on already. Please share your list! Feel free to include images or a link (e.g., to an inspiring video). You can list more than one person! I encourage you to try these in your class, whether it’s face-to-face and supplemented by a learning management system, a blended/hybrid format, or if you are teaching online! I hope to continue to tweak these and encourage students to add multi-media! Are any of you travelers? Tell us about a journey (or two!) that you have been on, whether it was a simple local day trip,staycation, or world journey! I have only been to Canada (briefly!) and Mexico (Tijuana!) and most of my travels have been in the United States. I like to read about other people’s traveling adventures. Feel free to post any pictures in your short narrative. Be detailed and descriptive in your write-up! What is your dream home? What is your dream car? What style and decorating themes best suit your interior design themes? Do you have home decorating tips? What car style do you like? Feel free to describe either or both! Icebreaker 15: Beautiful Moments-“What is your most beautiful moment in life”? What has been a “beautiful moment” in your life? It can be literal (e.g., a breathtaking view) or symbolic (e.g., life event). See my example here. You can write about more than one beautiful moment in your post! As you can see, students also learn a bit more about me both personally and professionally!